Many people overlook the important role that optimized nutrition can play in joint health and comfortable movement. And ArthroMax® Advanced with UC-II® & AprèsFlex® contains multiple nutrients to provide more joint support than ever before. The key to this advanced formula lies with two of its clinically validated nutrients: AprèsFlex® and UC-II®. 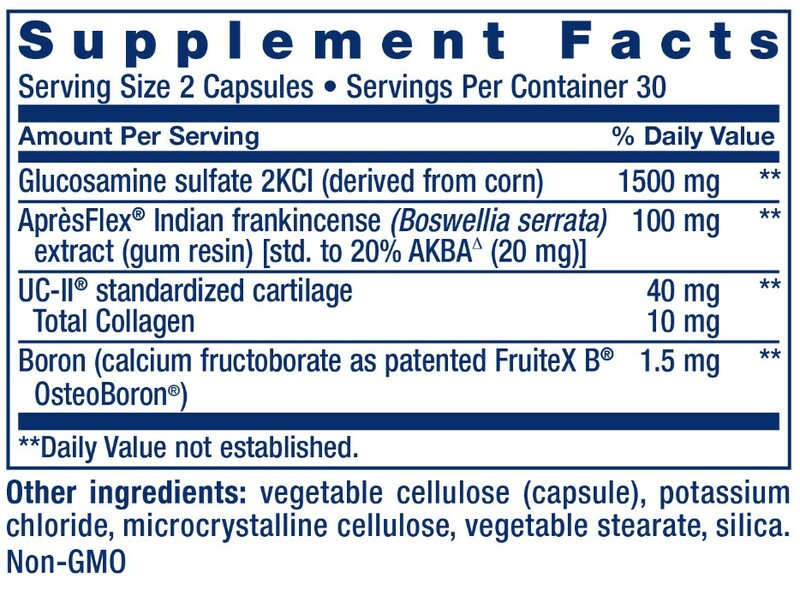 AprèsFlex® boswellia is a superior inhibitor of 5-LOX (5-lipoxygenase enzyme), and UC-II® promotes ease of motion. Choose the one joint health supplement developed from the ground up to ease your range of motion and support joint health. Try ArthroMax® Advanced with UC-II® & AprèsFlex® and today! If you experience age-related stiffness and joint discomfort, even the simplest everyday activities can become a real ordeal. Once your mobility is limited, it compromises virtually everything you do. But you now have a potent option to provide broad-spectrum support for aging joints …ArthroMax® Advanced with UC-II® & AprèsFlex®, a next generation, multi-nutrient formula based on the latest research. It includes two innovative, clinically validated nutrients … AprèsFlex® and UC-II® … to offer you superior joint support. ArthroMax® also provides glucosamine and boron to support the underlying structural foundation for joint and cartilage tissue. J Ethnopharmacol. 2006 Sep 19;107(2):249-53. UC-II® is a registered trademark of InterHealth N.I. (U.S. Patents 7,846,487, 7,083,820 and EPO Patent EP1435906B1; Canadian Patent CA 2459981C; and Japanese Patent JP 4800574B2).